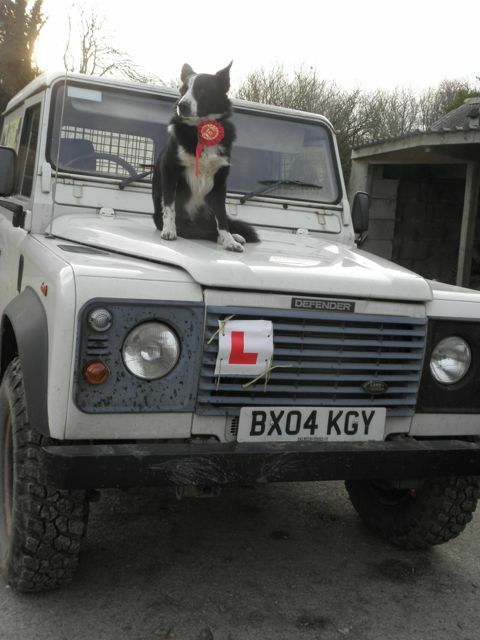 The ‘L’ plates are on the Land rover, but maybe Sweep doesn’t need them anymore! 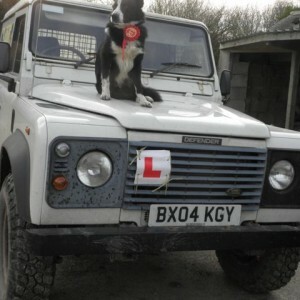 As with all of my sheepdog’s Sweep’s training has been full of ups and downs. He’s always been keen on his work although not with the complete obsession of Zola, which is quite nice in a way as it makes him easier to work with. For the first year of his life I was concerned about the length of his stride, he just didn’t seem to run with power, more of a scurry, but I’m pleased to say as this year has worn on, I’ve been less and less concerned about his legs. His training progress had been steady but unspectacular, but since Christmas he seems to have taken great strides forward. Strangely, a turning point seems to have been when he was off his food for a couple of days, a month or so ago. He wasn’t ill, just a little subdued, but still keen to work and it was during a light training session that I had a glimpse of the Sweep of years to come. Obviously feeling a little lethargic, he was less impetuous, and working slightly slower with a little more care! He was soon back to his normal self, but has improved sufficiently with his work that I decided that he could run in his first ever Sheepdog Trial last weekend. During the winter young sheepdogs can compete in ‘nursery’ trials. These are small courses that are a great chance to see how young dogs are shaping up for competition. When Sweeps turn came I was delighted with him, he behaved just as he does at home, very controlled and not over excited as can often happen with a young dog. And best of all he came away with first prize! He still has a long way to go, but I left the trial feeling greatly encouraged. Sweep had certainly proved himself and I’ve now confidence that he will be able to show off his skills at this summer’s Sheepdog and Falconry Displays.